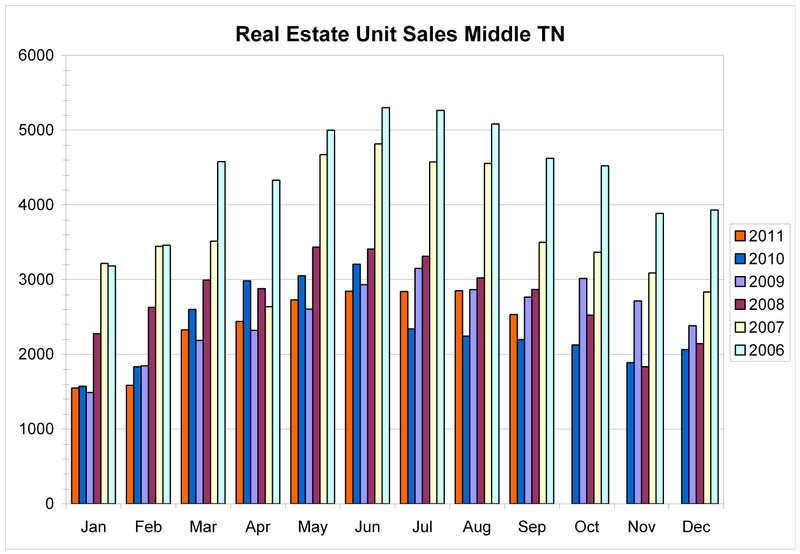 The graphic above shows the closings in the Middle TN MLS for the past 6 years excluding commercial transactions. While you can see that we are no where near the numbers from 2006 nor 2007, we are in a much more stable real estate market now. Looking at the detailed numbers, there were 335 more transactions this September than last September. That is a 15% increase. This is the 3rd consecutive month with double digit increases in the growth in sales from last year. These numbers are still not as high as I think that they could be if some of the buyers that want housing had two things, a little more cash in reserves and a lot more confidence in the economic outlook. Please review these numbers above and if you want to learn more about why this is the best time to invest in real estate please contact The Grumbles Team now to schedule a no risk appointment to find out what options are available. We specialize in helping buyers in Franklin, Spring Hill, Thompson's Station, and Brentwood. We also deliver quality marketing to the sellers in these areas. The Grumbles Team is our family serving your family with your real estate needs in Franklin, Tennessee 615-587-5843.